VBS Information is here! 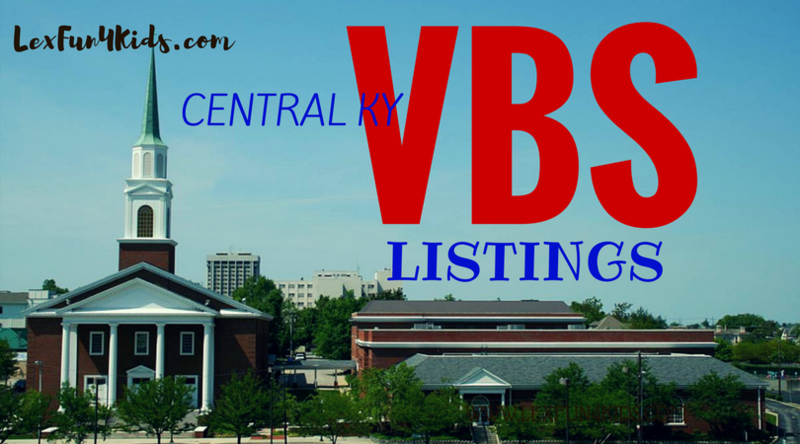 Check out local Vacation Bible Schools in Central KY this summer. Many are open for ages 3 or 4 through 5th grade. Be sure to check specific birthday and age restrictions when you register. June 3 – 7, 2018 6:30 – 9:00 p.m.
Ages 4 years old thru 5th grade (nursery is available each night for volunteers). VBS Kick-Off is Sunday June 3rd from 5:00 to 8:00 pm. There will be inflatables, a slip-n-slide, waterslide, and tons of food! Dress to get wet! June 25-29, 2018 6-8:15 p.m.
Cookout with bounce house on Friday, 6-8:15 p.m.
July 9-13, 2018 6 pm – 8:30 pm. Kids age 3 through the summer after 5th grade. July – 13th, 2018 6pm to 8:30pm Free dinner for the kids starting at 5:30pm. Kids age 3 to 11. July 22 – 26, 2018 6:15 p.m. to 8:45 p.m.
July 23 – 26, 2018 6-7:30 pm with optional dinner at 5:30. Pre registration is required and will open 6/27.